An illegal protest by police officers in Durban on Monday saw three members fired and more than 40 others facing strict disciplinary action. 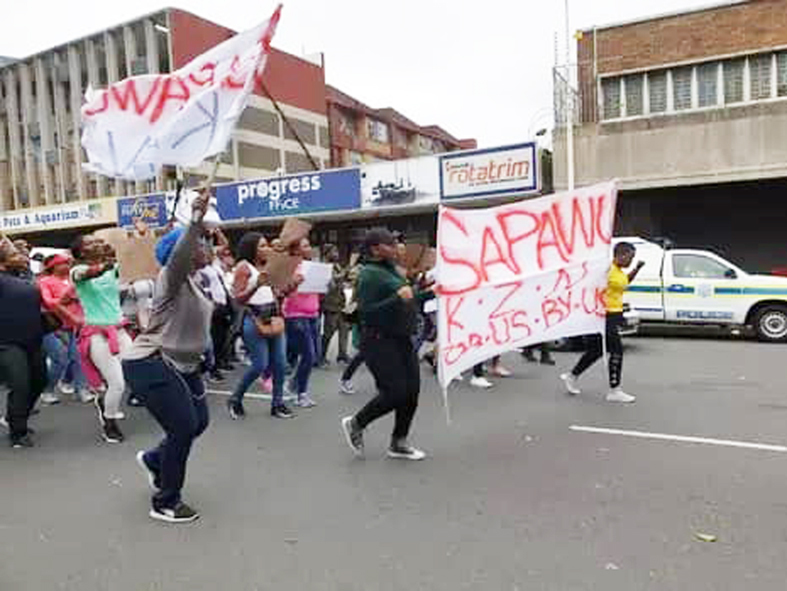 National police spokesperson, Brigadier Vishnu Naidoo, said the group are alleged to have marched through parts of the city to the SAPS Provincial Headquarters at the Servamus Building in Bram Fischer Street, Durban. The National Commissioner of the South African Police Service, General Khehla John Sitole welcomed the disciplinary action taken against the more than 40 protesting police officers. “The group demanded to speak to the acting provincial commissioner on a list of grievances. Discussions between the provincial police management went through the night until 2am on Tuesday morning. “However, they were informed that they were transgressing the law and that necessary disciplinary action will be instituted against them,” said Brig Naidoo. The members are likely to face charges in terms of the Gatherings Act, the Road Traffic Act, the SA Police Service Disciplinary Regulations as well as municipal bylaws. “Approximately half of the group, work at provincial units or stations while the other half are attached to national units, eg Rapid Rail Police, Operational Response Service, etc. Following the discussions, three members have been summarily dismissed, 21 will face disciplinary action at provincial level and 20 will face disciplinary action at their respective units at national level,” Brig Naidoo added. He said the dismissal of the latest three members brings the total to 11 following the dismissal of eight members in March this year at Cambridge police station in the Eastern Cape for embarking on unprotected industrial action. The National Commissioner has welcomed the speedy response by the acting provincial commissioner and his management team. “We will not tolerate our members holding both the SAPS as well as the people of South Africa at ransom through unprotected industrial actions,” said General Sitole. “We have tried and tested channels within the SAPS for members to air their grievances and members are constantly encouraged to make use of these channels rather than resorting to illegal public protests,’’ added General Sitole. “Communities can rest assured that the SAPS remains committed to delivering on its mandate to ensuring that people are and feel safe. On this note, as we draw closer to the National General Elections, the National Commissioner has instructed that up to 5 000 reservists be called up as a force multiplier to enhance security during the election period. In addition, 5 000 trainees that are currently at police academies will be placed on standby as a contingency, should the need arise to complement the dedicated team that has already been assigned to ensure a safe environment for the conducting of free and fair elections,” Brig Naidoo said.